Volkswagen's 2009 Jetta TDI twins are now available in all 50 states, a first for clean diesel vehicles in the U.S. In theory, for just $21,990 you can be the proud owner of a TDI sedan that gets an EPA estimated 29/40 mpg (or 38/44 mpg according to another group). Buy one now and the federal government will knock some more off the cost thanks to a $1300 tax credit. We just called to check with a local dealer and they started taking deliveries on Friday, though the first batch of cars are already spoken for and it may be a while before you can get one for the list price. Full release after the jump. Volkswagen’s all-new clean diesel is right for the times and now available in all 50 states HERNDON, Va.—Volkswagen of America, Inc. today announced that their all-new, and highly anticipated 50-state compliant clean diesel Jetta TDI sedan and SportWagen are now available for customer delivery. “We’re proud to be the first manufacturer to offer a clean diesel vehicle for sale in all fifty states,” said Stefan Jacoby, CEO/President, Volkswagen of America, Inc. “We believe our Jetta TDI’s truly offer a no compromise alternative fuel driving experience, that provides the customer the best of both worlds—excellent fuel efficiency combined with a dynamic driving experience.” The Environmental Protection Agency estimates the Jetta TDI at an economical 29 mpg City and 40 mpg Highway. 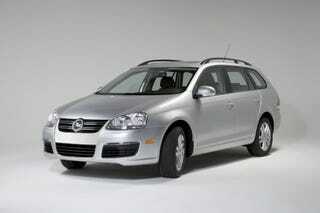 Volkswagen went a step further to evaluate the real world fuel economy of the Jetta TDI. Leading third-party certifier, AMCI, tested the Jetta TDI and found it performed 24 percent better in real world conditions, achieving 38 mpg in the City and 44 mpg on the Highway. * EPA research has concluded that if diesels were to power one third of all light duty vehicles in the United States, the shift would save approximately 1.4 million barrels of oil a day—equal to the daily shipments from Saudi Arabia to the U.S. Providing even more value to the Jetta TDI sedan and SportWagen, a $1300 Federal Income Tax Credit was recently announced. The Internal Revenue Service issued a certification letter affirming that both vehicles qualify for an Advanced Lean Burn Technology Motor Vehicle income tax credit. The Jetta TDI’s come standard with Volkswagen’s Prevent and Preserve Safety System, consisting of numerous standard safety features. Jetta TDI’s include six airbags, with optional rear side airbags, and like all 2009 model year Volkswagens, Jetta TDI’s also feature standard Electronic Stabilization Program (ESP) for added safety. Also standard for 2009 is Volkswagen’s carefree maintenance program, with this program there are no charges for the scheduled maintenance described in the vehicle’s maintenance booklet for the length of the New Vehicle Limited Warranty—three years or 36,000 miles, whichever occurs first. Recently Volkswagen announced pricing for their Jetta TDI sedan and SportWagen would start at $21,990 and $23,590, respectively.